Amanda has been part of the Ambre Blends team part-time since June, and we are so lucky that she decided to come on board full-time at the end of October! Read on to find out more about Amanda in today’s Staff Spotlight! What is a day in the life of Amanda like? But first…COFFEE! After getting our boys around for school, I’m out of the door before they catch the bus. Thankfully, my husband has a very flexible work schedule and is able to tackle that part. After work, it’s a typical evening of dinner at the dinner table followed by a bit of family roughhousing (boy mom). I always make time to squeeze in a workout. I do have the guilty pleasure of earning Survivor or The Bachelor/ette if they’re on. Nine times out of ten, I look at the clock and it’s close to midnight. 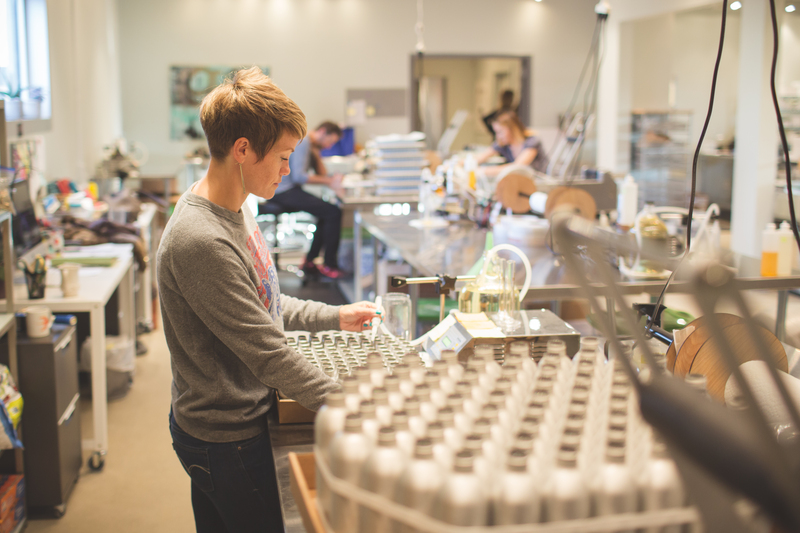 What is your favorite part about working for Ambre Blends? Since none of my sweet sisters live nearby, and my house is full of boys, working at Ambre Blends is like having sisters. We all get along, work hard and play hard. What are some of your favorite organic products that you use? I’m a firm believer that what you put in your body should be just as important as what you put on your body. We eat pretty clean and I try to buy locally grown produce whenever possible. About 90% of the food we buy is organic except for the occasional pack of Oreos! We use Tom’s toothpaste, Ambre Blends Natural Deodorant, Dr. Bronner’s and Mrs. Meyer’s soaps and household cleaners. We use A LOT of Bragg’s apple cider vinegar. What is your favorite Ambre Blends product/essence? I used to be a die-hard Solace girl, but Ahnu is definitely creeping up into first place. I love the Skin Tonic and so does my husband. I LOVE the Body Cream and Ambre Glow. I think the Glow is a flirty twist on the Body Cream. What do you enjoy doing outside of work? Music plays a big role in our lives. We see a lot of concerts. My parents have a several hundred-acre farm in northern Indiana that we love to spend time at. My in-laws also have a lake house in northern Indiana, right down the road from my parents. The long and short of it…when we aren’t at a concert, we are in northern Indiana riding dirt bikes, snowmobiles and boating! Why do you think people should be using Ambre Blends products? Every single item in our product line has been hand-made, hand-labeled and inspected with the consumer’s best interest in mind. I wish people knew the amount of LOVE that radiates inside the Ambre Blends Disco Hut, it’s truly a magical place. What has been one of the most rewarding experiences about working at Ambre Blends? It’s been a pipe dream of mine for YEARS to be part of the Ambre Blends team. I was literally over the moon when I was offered a job with the company. I’m so proud to tell people “I WORK THERE” When the opportunity presents itself. I think that everyone deserves a job that they love and also where they are valued. Ambre treats every single one of us exceptionally well. What was your first job? My first real job was at an ice cream shop called The Creamery. I rode my Honda Spree to work!